Sometimes you just have to stand in awe of the nerve of the Discoveryless Institute's propaganda machine. Chapman, a Roman Catholic himself, emphasized that the conference's sponsor, The Pontifical Council on Culture, is an office of the Vatican but represented neither the Vatican nor the Pope himself. "Just because someone has money to come to Rome and have a conference doesn't mean they speak for the Catholic Church, anymore than some Committee in the Senate or the House can speak for the United States government," he said. But what does Chapman then do? He [Chapman] said that while intelligent design proponents and the Catholic Church accept microevolution, he believes both reject the proposal by Darwin that unguided random chance and mutation produces new species and how it suggests life was created that way. In other words, after denying that an office of the Vatican can be thought to speak for the Church or the Pope, he turns around, as the head of an organization totally unrelated to the Church, and presumes to speak on behalf of it. 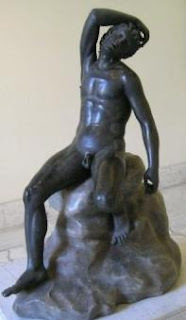 Somewhere in Rome there is a brass statue missing its balls. Who speaks officially for the "Intelligent Design" movement? Good question. Since its ranks are mostly made up of a hodgepodge of creationists of various stripes trying to dress their beliefs up in scientific wolves' clothing, I doubt anyone speaks ex officio for the mix of young-Earth creationists, old-Earth creationists, contrarians, et al. that that fly the banner. But, as far as the leader of the guild of crafters of disingenuous arguments goes, the DI comes pretty close.